When the coating application is complete and the final inspection is over and the QA documents are verified, reviewed and signed – it’s difficult to remember it all started with surface preparation. VANWIN knows surface preparation! VANWIN has environmentally controlled blasting operations in both of our facilities. We have a wide range of surface preparation options for our customer base. 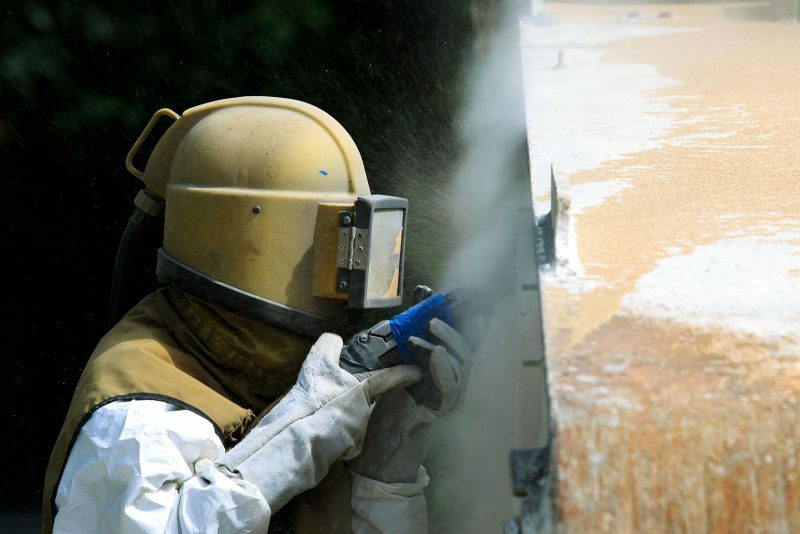 We offer abrasive blasting utilizing black beauty, garnet, aluminum oxide, crushed glass, slurry blasting utilizing the same media base as dry abrasive blasting, UHP waterjetting and pressure washing as well as power-tooling. For specialized needs, we offer plastic bead or glass bead blasting. We even have a semi-automatic tumble blaster. 1,200 square-foot blast room with 24’ overhead clearance. This blast room is supported by multiple blast pots for various abrasives. All of our blast enclosures are supported by high volume dust collection. Although our large blast enclosure is 60 feet in length, occasionally we are called upon to accommodate bigger projects at our facility. Should you have a similar need, we have a solution. If the structure can be trucked to our facility and a crane can lift it, VANWIN can construct a temporary enclosure with containment sheeting and accomplish the work in our yard. VANWIN installs dust collection, dehumidification and lighting in the temporary structure and performs blasting and painting as if the structure was in one of our fixed facilities. If you can’t get it to us – we come to you. VANWIN can mobilize blasting equipment and personnel to your location. We can erect containment structures at your location. We have solutions. We are familiar with current environmental requirements and can engineer a process around your need. As with all of our operations, each process is governed by industry standards and customer specifications. These processes are witnessed and inspected by our QA staff to assure the final product meets the stated requirements.